Performers “rebrand” the famous painting and impersonate oil executives, in protest against the Gallery’s Shell sponsorship, privatisation plans, and the sacking of PCS Union rep Candy Udwin. At 1pm today (1 June 2015), 30 campaigners occupied the room containing Van Gogh’s ‘Sunflowers’ in the National Gallery. They staged a surprise protest performance criticising the Gallery’s proposed privatisation plans, and its controversial funding relationship with the oil company Shell. The performance began with two “Shell executives” giving a speech to surprised gallery visitors, explaining how happy they were to be using arts sponsorship to distract attention from Shell’s destructive extraction activities and contribution to climate change. The fake executives explained how “with this sponsorship the public will associate us more with art than Arctic drilling”. They also praised the Gallery’s plans to outsource up to two-thirds of its staff, calling it “a real commitment to privatisation; we fully support this attack on workers’ rights”. At this point, thirty more protesters revealed themselves, loudly condemned the Shell executives, and launched into a series of noisy chants and songs calling on the Gallery to end their relationship with Shell and halt the privatisation. They unfurled banners reading “Art for People not Profit” and “Kick Out Shell, Bring Back Candy”. This second banner refers to sacked PCS union rep Candy Udwin, who was unfairly dismissed from her job at the Gallery after raising concerns about the cost of the privatisation plans. PCS union members at the National Gallery are currently on strike over the outsourcing proposal, and are calling for Candy’s reinstatement . The group then processed through the gallery, chanting “No oil sponsorship! No privatisation! Reinstate Candy!” and singing “We want Candy – reinstated!” to the tune of the classic Bow Wow Wow song. Several security guards believed that the shell executives were genuine and attempted to shield them from the protesters. The protesters were eventually removed by private security guards, as many of the Gallery’s own security staff are participating in the strike. Outside the gallery, the fake Shell employees unveiled a “new improved” version of Van Gogh’s sunflower painting, with several of the flowers replaced by oily Shell logos. Today’s performance was organised by activists from the “Reclaim the Power” action camp taking place near Didcot power station this week, , supported by members of theatrical protest group BP or not BP? . It was part of a global day of action against the political power of the fossil fuel industry and their influence on climate and energy policy . 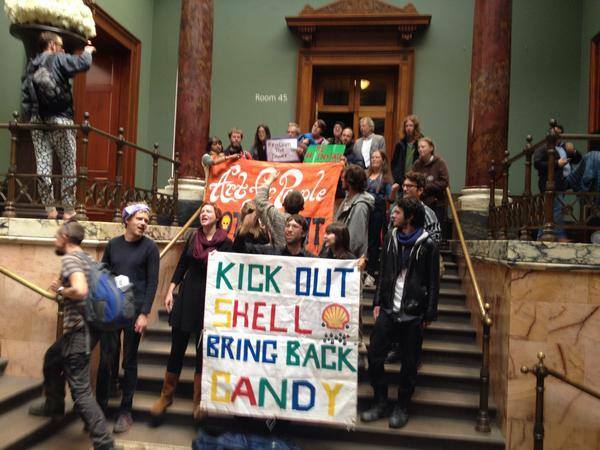 The National Gallery is not the only institution under fire for its relationship with Shell. Documents released yesterday have revealed that Shell has been attempting to influence the content of the climate change exhibition at the Science Museum, which the oil company also sponsors . Hello, thank you for joining us today at the National Gallery, where we will be talking about how our sponsorship of the gallery helps us cover up our environmental and social misdeeds. Yes, smearing our logo over this institution has allowed us to destroy numerous communities and the environment without fear of repercussions, particularly in the Niger Delta. And as we turn to more expensive and damaging sources of fossil fuels, our stakeholders can rest assured that with this sponsorship the public will associate us more with art than Arctic drilling. We’re all about locking the UK introit a future of fossil fuel dependency. By lobbying against investment in cheaper renewables and energy efficiency methods, we help maintain fuel poverty and keep those winter fuel subsidies rolling in. Here at Shell we are all about putting profit before people and so we are absolutely thrilled to hear that the National Gallery has suspended their union rep Candy Udwin…wait, sorry…the National Gallery has sacked their union rep Candy Udwin. We feel this shows a real commitment to privatisation and we fully support this attack on workers’ rights. Profitability, privatisation and corporate sponsorship: we’re delighted to see that the National Gallery has prioritised the needs of corporations like us rather than the public, the environment, its workers and the artworks in its keeping. http://www.pcs.org.uk/en/news_and_events/news_centre/index.cfm/national-gallery-plans-to-privatise-visitor-services . The PCS Union has put forward an alternative staffing plan that would meet the Gallery’s needs without privatisation, but the Gallery management has so far refused to consider it. http://www.bbc.co.uk/news/uk-england-london-32942584 . Famous names from the world of arts and culture have expressed their support for the strikers, including Ken Loach, Grayson Perry, Mark Wallinger, Ryan Gander and Peter Kennard.